Svente is a small town situated not far from Daugavpils. 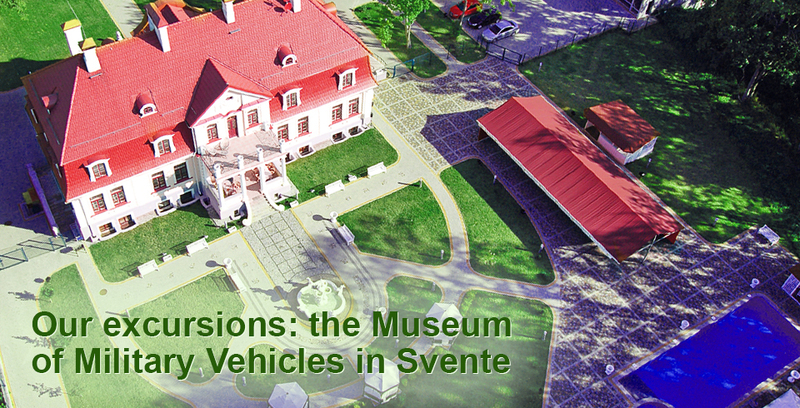 It is interesting because of the Svente Manor that used to belong to a noble German family, and the private collection of military vehicles. The manor was reconstructed in 2005, and the hotel with a restaurant and sauna was opened there . The collection of military vehicles contains a few dozens of exhibits. You can see tanks, armoured personnel carriers, automobiles and guns from the World War II and post-war periods. All vehicles and equipment are in mint condition; there is an impression that they have just been manufactured. A local restorer worked with the exhibits. He did a fantastic job – all pieces are 100% operational (except the armour – it’s a legal requirement). The latest modification of the most numerous tank in the world – Т-34, which was manufactured from 1943 till 1946. The tank you can see in the collection was taken from the bog not far from the town of Tukums in the western part of Latvia. Surprisingly, the tank was in a good condition, and it could drive already on the third day after it had been pulled out of the bog. A Soviet heavy tank. IS stands for “Joseph Stalin”. The tank was found in the same bog as Т-34-85. IS-2 was the most powerful and heavily armoured tanks in the allies’ armies. It was modernised after the war and it was used by the armies in different states until 1995. Sturmgeschütz III, or simply StuG III – a German SPG. The vehicle did really well during the war; there were more than 8.5 thousand vehicles manufactured until 1945. It was the most numerous armoured vehicle in the German army. All people who are interested in military history know StuG III. It is also one of the most popular models in model building. StuG IV – is a further development of the previous model. More than 1,000 vehicles were manufactured during the war. However, only three vehicles have been preserved up today: one vehicle in the Svente museum, and two in Poland. Besides that, there are a lot of other interesting vehicles in the museum collection – SAU, Soviet and German armoured personnel carriers of different models and modifications, automobiles and guns. In spite of the fact that by large museums’ standards the collection is not really big, it is definitely worth seeing. If you are keen on military history it’s a must see place.